Next month I’m doing this whole vegan thing. I’ll eating and baking only vegan foods for one entire month and seeing how it goes. Why? I don’t know. Why do I run marathons? A challenge I guess, and one I’m super excited for! I’m a vegetarian anyway, so “Veganized November” shouldn’t be a problem, and I’m really looking forward to trying some new recipes that maybe I otherwise wouldn’t have tried. SO! If YOU have any vegan recipes that you’d like to share, send me a link! 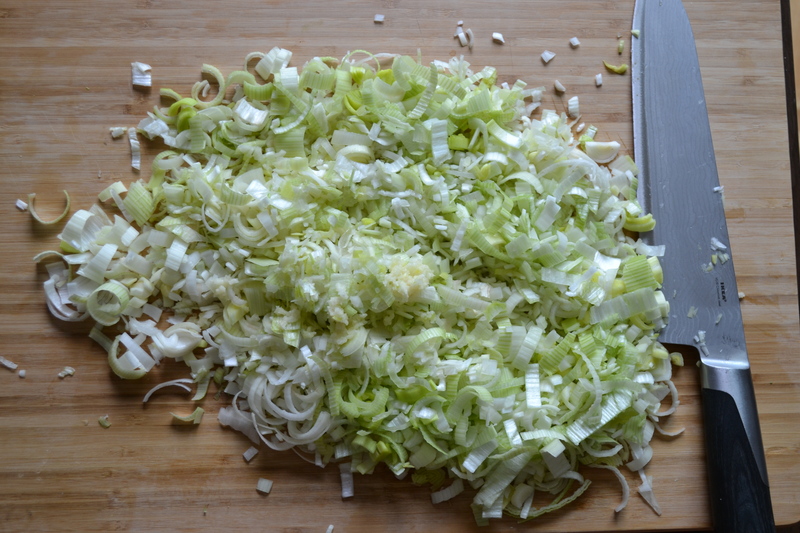 To make this soup, chop up your veggies. Here are my cool lookin’ leeks. 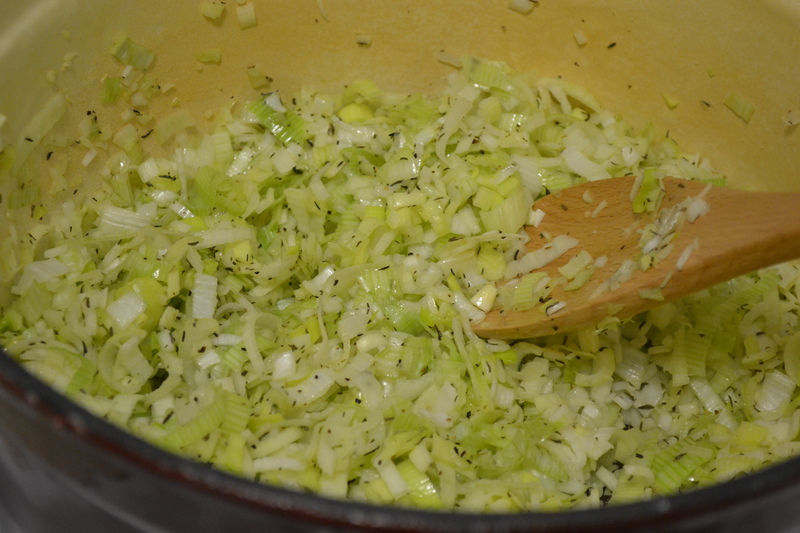 In large saucepan, heat oil over medium heat; fry leeks, garlic, thyme, salt and pepper, stirring occasionally, until leeks are softened, about 5 minutes. Add stock, 3 cups (750 mL) water and squash; bring to boil. 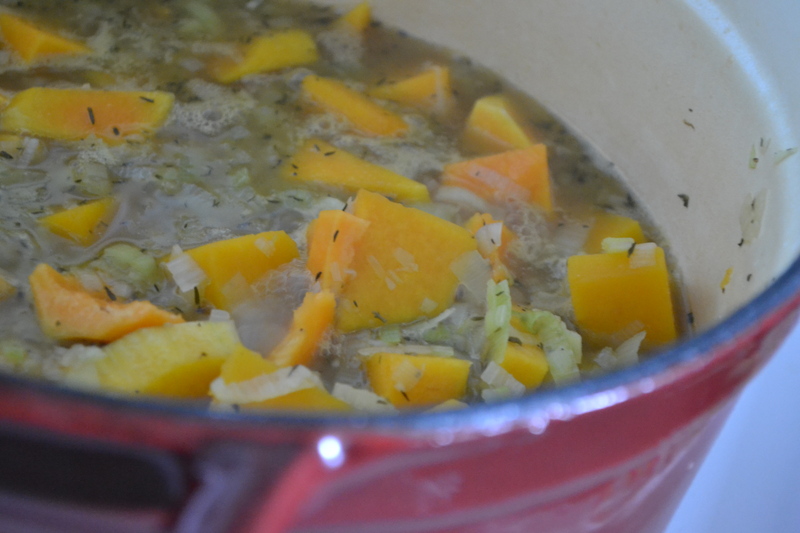 Reduce heat, cover and simmer until squash is tender, about 15 minutes. 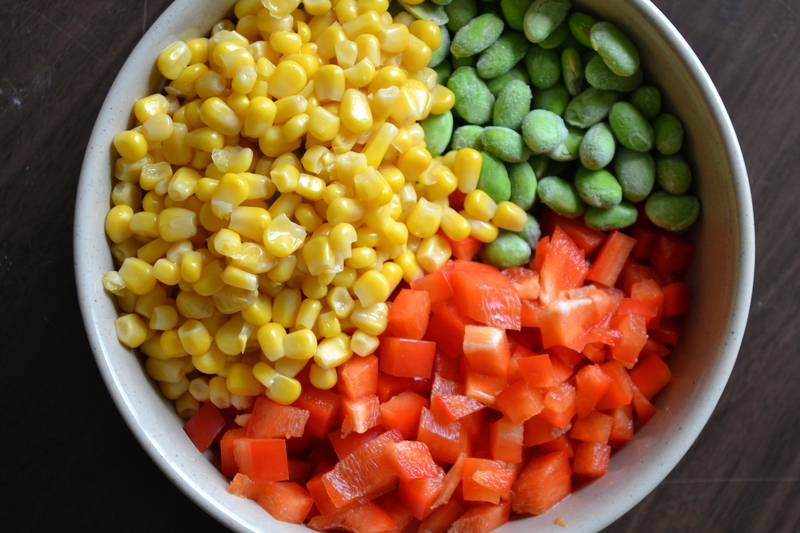 Gather your edamame, red pepper and corn. Add them to pot and simmer until pepper is tender, about 5 minutes. Now it’s ready! 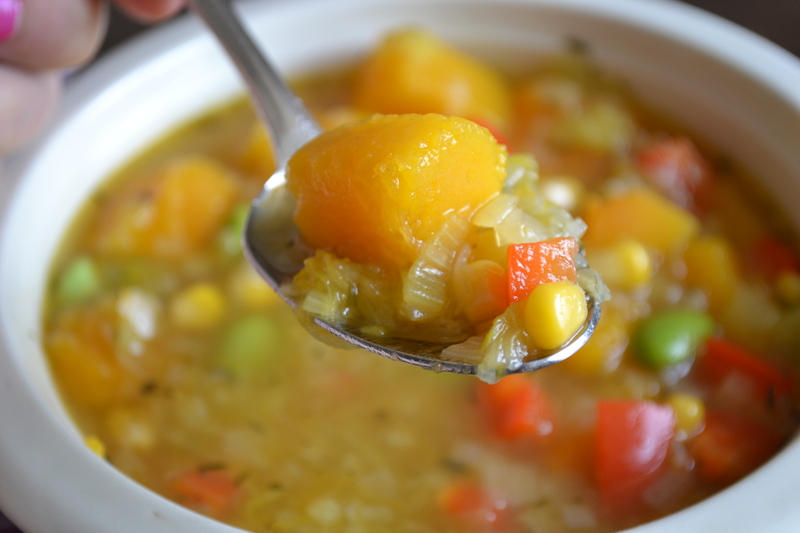 You can refrigerate this soup in airtight container for up to 3 days, or freeze it. Yum. Add edamame, red pepper and corn; simmer until pepper is tender, about 5 minutes. 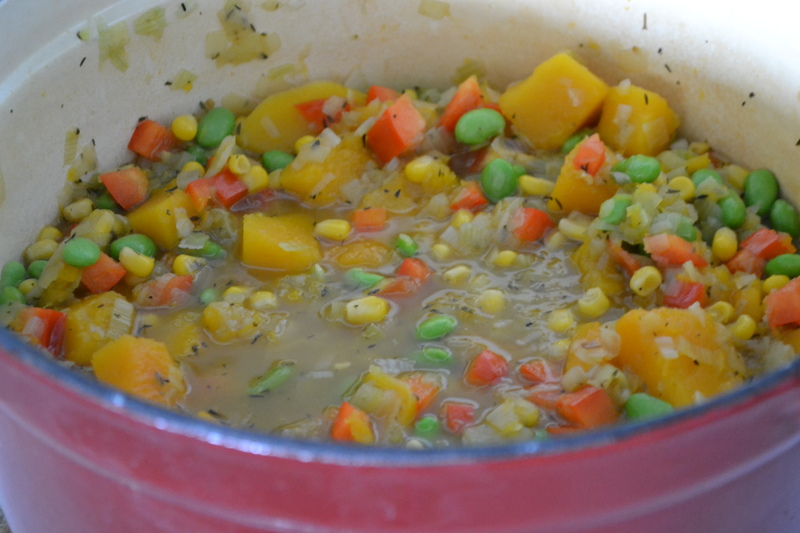 You can refrigerate this soup in airtight container for up to 3 days, or freeze it! Love the colors in this soup! I have a butternut squash sitting on the counter top waiting for something good to come along. This might just be it! Yummy! I simply love pumpkin! 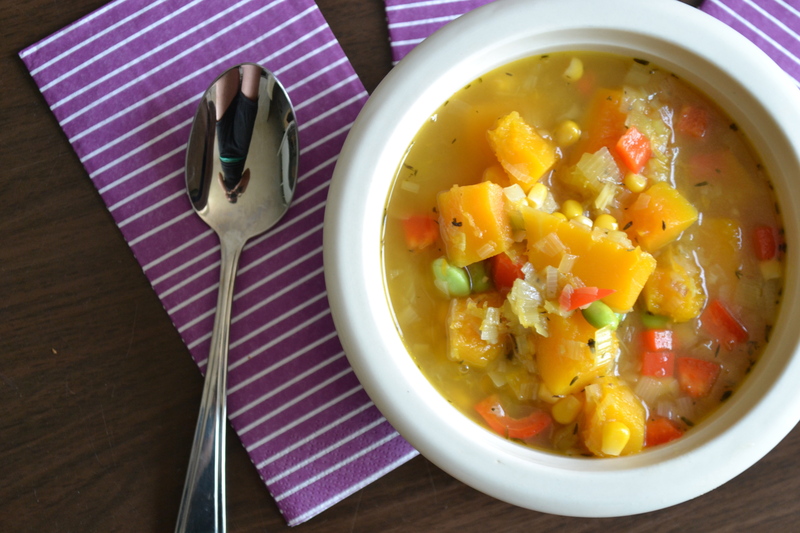 The veggies are so bright and colorful in this soup – looks like a sunny Fall day! I love trying new soups in the fall/winter. I am adding this to my MUST MAKE list! Awesome! My family prefers chunky soups over pureed because the older girls think purees are for babies! I’m definitely bookmarking this! Interesting challenge, I’m looking forward to hearing how you get on! What a great challenge, and I’m so glad you shared this soup! Delicious! And perfect timing too because I’m about to go the grocery store. 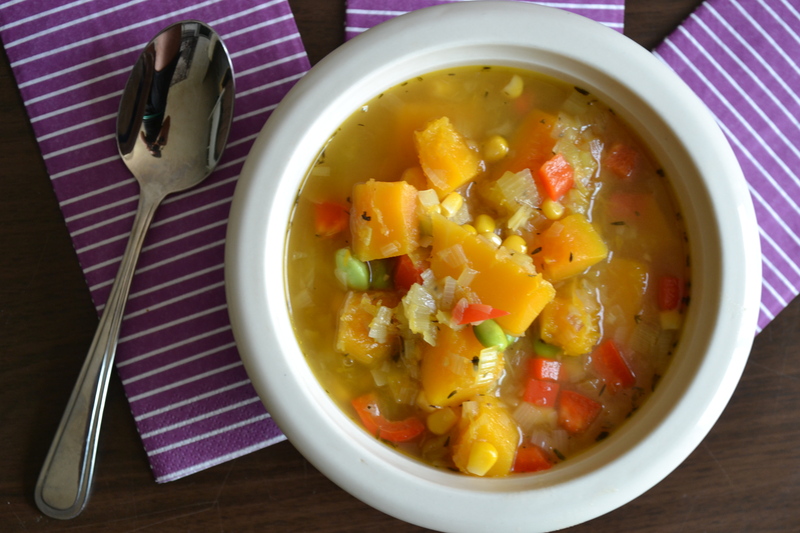 Add butternut squash and corn to the list! Thank you for sharing. I hope you have a wonderful end to your weekend! Looks so yummy! And filling enough for an evening meal. perfect fall dish – love the colors and looks delicious! the colors in this soup remind me of fall! Love it! This sounds like an uber fun challenge to me…but I’m i the psycho-marathon-running-boat also. Maybe it’s in our genes. :P This soup looks fabulous! So many of my favorite things in one place. I love love love the colours! This soup is gorgeous! I love the idea of doing a vegan month! 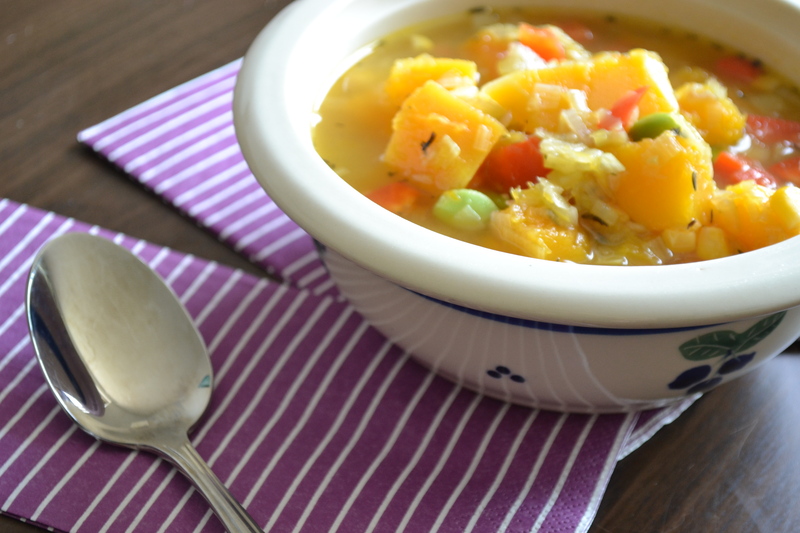 What a nice hearty fall soup with one of my favorites…butternut squash! Such a gorgeous soup! Looks absolutely delicious, with so many good fall flavors and colors. Can’t wait to try this out, and good luck on the vegan month! Sounds like a fun challenge. This soup sounds amazingly good! I think it’d be great for Thanksgiving, too! This was delicious. Thanks for sharing. My vegan daughter and meat eating husband loved it.